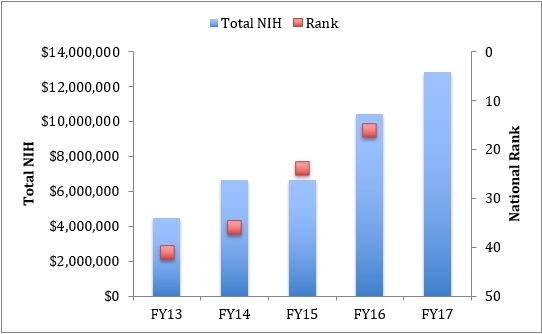 Total NIH funding in the Department of Pathology and Laboratory Medicine amounted to $12.8M during the 2017 academic year. This represents an almost 3-fold increase since 2013 and propelled the department to rank 16th among pathology departments nationally last year. Currently, the department has 11 NIH funded investigators with a combined total of 37 NIH awards. This success by our research faculty is especially remarkable considering the relatively small size of our department and the challenging funding environment. Next post: Pathology Welcomes 6 New Residents – Arriving June 20!